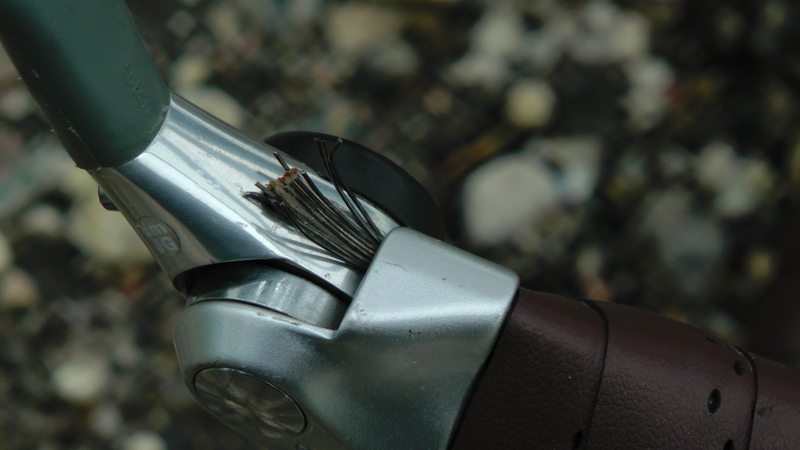 It’s that time of year again… tick season! Anya spotted them as we were doing some post-ride stretches at the campground. She alm0st couldn’t believe they were ticks because there were so many. We found about 5 on our “yoga mats” (actually just our sleeping mats) and brushed about as many off the tent exterior in the morning. The locals confirmed it: 2012 has seen record tick numbers. Maria even woke up early to fix the problem herself but discovered that we had lost both our spare cables. Luckily in the prairies middle gear is often sufficient. In the prairies you can see your dog run away for 3 days. It wasn’t only the cables that were missing. Somewhere along the way, Maria had lost both her warm sweaters. Anya, lending Maria her down jacket for the evening, decided we’d do some clothes shopping in Regina. 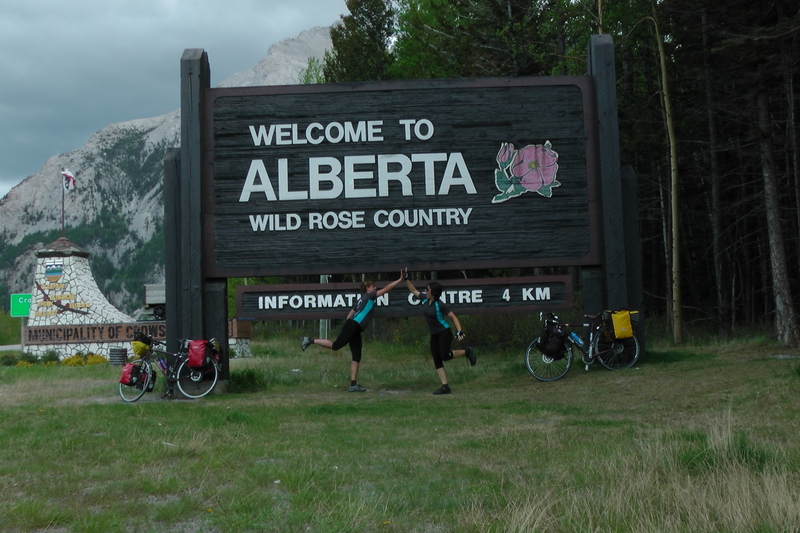 We rode into Regina on the Trans Canada. Bad decision. On the stretch of highway past Moose Jaw, there was more roadkill than anywhere else so far on our journey. We saw four dead deer in just 80 km — compare that to zero dead deer in 2,000+km! Not to mention the increased number of the typical victims: birds and rodents. To spare our viewers, we will refrain ourselves from posting photographic evidence. Our Regina connection is Maria’s family friend, Alex. He actually managed to feed us too much food! This is a most impressive feat of hospitality. He also gave us a tour around town, and kept us entertained with philosophical conversations. One thing we talked about is connection to nature. Having lived and worked both in large cities (like Vancouver) and small ones (like Regina), Alex can say that he prefers the smaller cities. 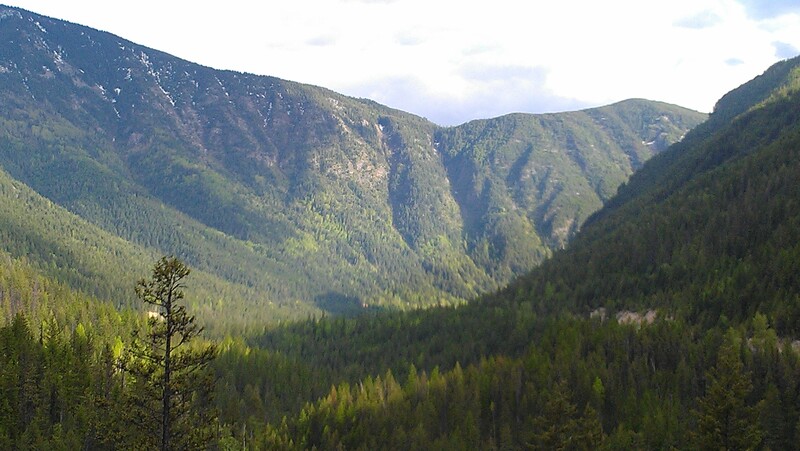 Aside from the fact that it is easier to get from A to B in a smaller town, it is also often easier to access nature. For Alex (and for us, actually!) being around nature is a way to get away from distractions, clear your mind and better understand yourself. Access to nature is important, but in large cities, it’s not always available. In the morning, we were well-rested and the sun was out. Everything seemed great, and we were cycling at a solid pace. Turning onto Highway 22 we saw this sign, and poked fun at it by taking silly pictures. Little did we know what the weather gods had in store for us. Also, Maria’s rear tire was partially deflated and we had to pump it up. We assumed that was the end of it. 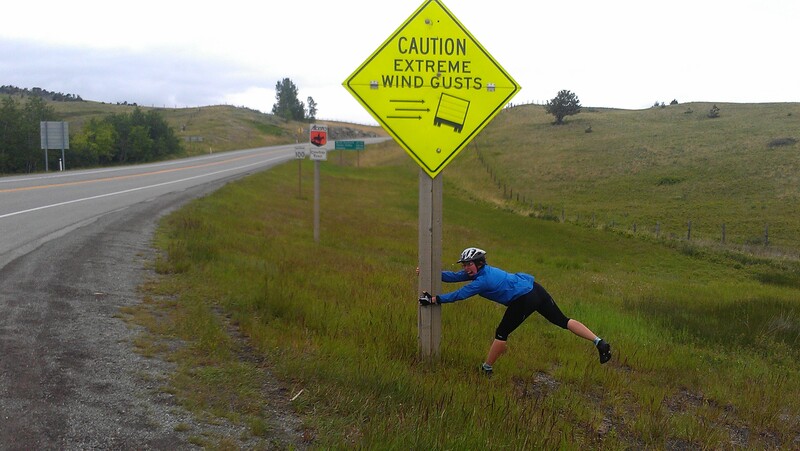 At first we were confronted with massive side- and headwind. Our pace slowed noticeably. For the first time during our trip, we had to cycle close together such that the person in front would block the wind for the person in the back. By this point we realized Maria’s back tire had a slow leak, as we had to pump it up again. Our ambitions of getting to Black Diamond (a 140km day) crumbled. Around 5pm the rain started up. By this point in the trip we knew a rain-bringing cloud when we saw one, so we quickly put on our rain gear – and not a minute too soon. But unlike previous downpours, this one just kept going and going. In addition, we started seeing some lightning and hearing thunder, although it was still far away. 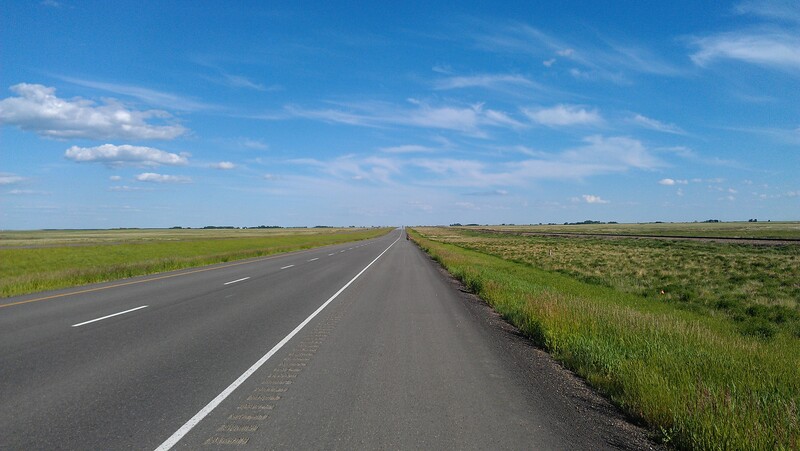 The particular stretch of highway we were cycling along is interesting because from the turn-off onto it and until Black Diamond, a 130-km stretch, there is literally nothing. No gas stations, no corner stores, no campgrounds: just fields with grazing cows. We knew this in advance, too, because there was a sign. So we were slowly making peace with the idea that we would camp on the grass beside the highway. Our spirits were low when we had to stop a third time to inflate Maria’s tire. 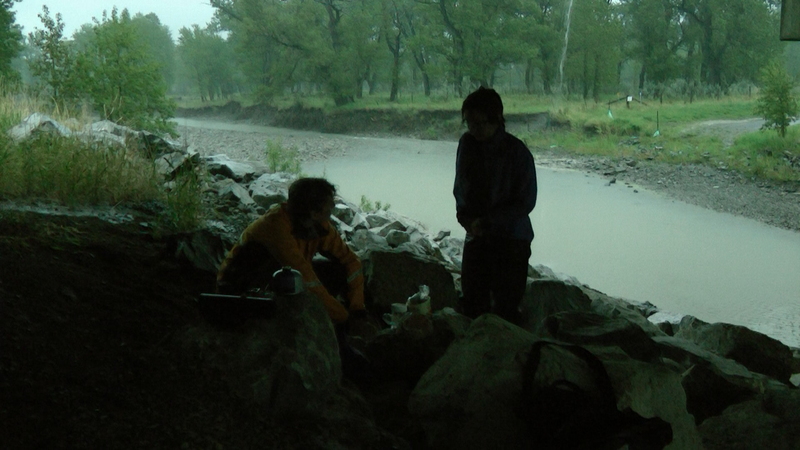 It was already 8pm, and our waterproof-breathable jackets were soaking through. We got going again, but the lightning was getting closer (we were counting the time between the lightning and thunder). After cycling another ten minutes we both had the idea to just stop for the night already. Within a few minutes we were lucky enough to discover a bridge. So we did the hobo thing, and set up camp right there. In the morning, we finally cobbled together enough enthusiasm to change the tube in Maria’s tire. It was still cold and wet, though it was not thundering anymore. Grudgingly we started out, in full rain gear, preparing ourselves for a half-day of cycling followed by warming up in the nearest B&B. But within an hour the sun caught up with us! We stopped at Bar U Ranch for breakfast/lunch and ate the most delicious, largest brunch in the world: soup, burgers, chicken wings, and dessert. 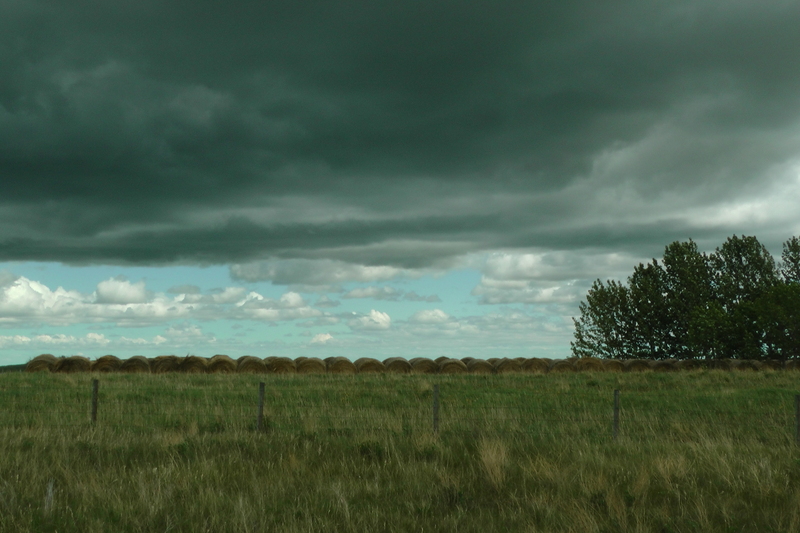 The attendants there told us there had been 2 tornadoes that touched down near Medicine Hat the day before. Bonanza! Day 10 was hard. After cycling up a 1535m pass, we found out the campground where we were planning to stay at was closed because of a problem grizzly bear. So we put in an extra 25km (okay, downhill) averaging 45km/h. Did you know? Grizzlies can actually run at speeds exceeding 50km/h! On Day 11 we took it easy and cycled 50km to Nelson. By that point our bikes had survived 800+km, including 100+km on the KVR trail, so we took them to the bike shop. The bikes got a thorough inspection by Blair and we were warmly welcomed with locally brewed beer. The people at the shop were interested to hear about our project. Mark, a mechanic at the shop, had a sustainability story to share: since he moved to Nelson 4 years ago, he’s worked on reviving the three overgrown fruit trees in his yard. Last year was the first year they gave fruit. This year, his goal is to be self-sufficient and grow all his own fruits and greens. Way to go! We were hosted by Anya’s extended MSLS family: Alison, Steven, and Elliot. We talked about Nelson’s focus on community and local economy.The municipality of Nelson, Alison told us, has a strict no billboard policy, which is why you can’t even find the Walmart in town. As for the McDonalds, there isn’t one, because the town didn’t allow one to be built. With that kind of support for local commerce from the municipality, it’s no surprise that Nelson is home to so many successful co-ops and small businesses. As mentioned in our previous post, Nancy of Grand Forks told us about the Kootenay Food Co-op and gave us contact information. We were able to arrange a conversation with Jocelyn, who is currently the Co-op’s marketing manager. The Co-op is amazing. It has been around for 37 years and has more than 10,000 members (population of Nelson – 20,000). 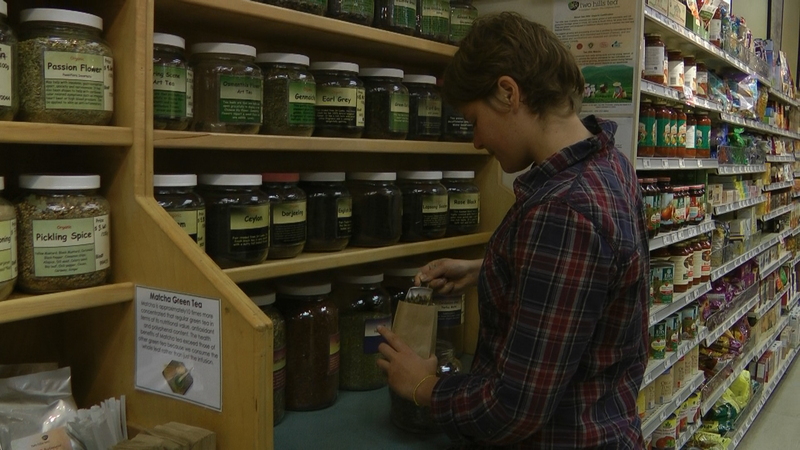 They have everything in bulk – grains, tea, herbs, oil, shampoo, detergent, and more. A buzzing community hub, the Co-op hosts overwhelmingly popular cooking classes that sell out within 3 days of being announced. They also promote local production by mentoring, supporting, and encouraging local residents to start up their own food businesses. Jocelyn is very knowledgeable and shared a lot of great ideas with us — so many that we can’t possibly cover them all in this entry. We recorded the conversation on video, so watch our movie when it comes out. For now, here’s a sample. One thing we talked about are the difficulties of running a small, local farm. Large corporations lobby to lower the organic certification standards so that they are able to carry “organic” products, lowering the cost at the expense of food quality. In contrast, the food co-op preferentially purchases higher-quality, local food, and pays the farmers a fair price, while bringing affordable and top-notch produce to the co-op members. To actually be able to give a fair price to both farmer and consumer is an immense challenge that the co-op tackles daily. I choose to believe there are nerds and gear-heads like myself among our readers. I spent a fair bit of time reading product reviews and pursuing Craigslist to assemble our A/V equipment. Here are the fruit of my labours. So I haven’t talked to you about my friend yet, so I thought I would show off my new companion before we hit the long road together. Before we met he was just a new 2011 Norco Cabot, but then the transformation happened. He was upgraded to disc brakes (Avid BB7), straight bar with fancy horny bar ends (Ergon GC3), shifters (Shimano 9 speed) and levers (Avid FR5) to match the bar, solid front (Axiom Journey) and rear (Topeak Super Tourist) racks, virtually puncture proof tires (Schwalbe Marathon Plus), fenders (Axiom Roadrunner), clippy pedals (Shimano SPD) and my good old well molded and tested saddle. Thank you to the Bike Doctor for the support in the purchase and adjustments. Special thanks to my favourite bike mechanic Alex Ivanov for all the hard work he put into customizing my bicycle. I present to you the new and improved Cabot, Anya’s edition. A video is worth 1000 words x 30 frames per second x 42 seconds = 1260000 words. I think I just wrote War and Peace? After long and arduous consideration I settled on a Brodie Elan. Essentially, I spent a long time reading about optimal frame geometry and other technical blog posts, but made my decision based on actually sitting on the bike and testing the fit for myself. 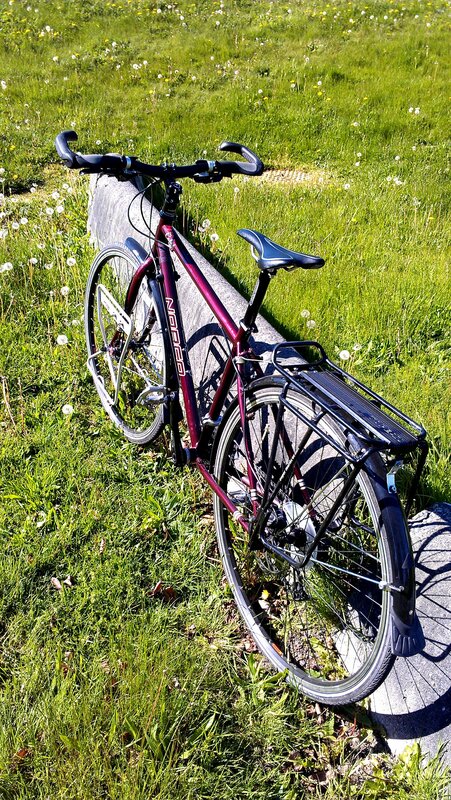 I added a Brooks saddle, clip-in pedals, and a front and rear rack. As further training I did a relaxed cycle tour to the Olympic Peninsula over the long weekend. Besides trying the bike I also tested out my Icebreaker merino wool bike clothes. I’d never really owned a pair of cycle pants with built-in cushioning for the, ahem, derrière. When I first put them on, it felt weird and I wasn’t totally sold on it. But after four days on a brand-new leather saddle I felt no real derrière discomfort. Pretty impressive.